There's never been a more exciting and challenging time to be a marketer. 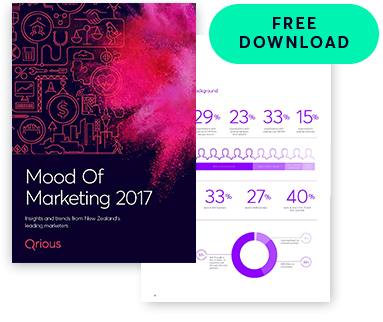 The role of marketing is being disrupted by technology and the data now available at our finger tips. Both are providing new opportunities for those who move swiftly to adopt them. Technology and the explosion of data is revolutionising opportunities for marketers. Personalisation is no longer just a pipedream. The race is on to secure people with certain skills, find out who's in hot demand. Congrats! You are all set to find out what your peers think about the future of marketing in New Zealand. Any personal information collected will be held by Qrious Limited (or its affiliates) and your details will be added to its database. Qrious may use these details to keep you up to date on relevant Qrious products and services. You have the right to access, update, and correct such information held by Qrious. "Our role in understanding the customer is becoming fundamental to driving business outcomes." "Marketing is moving from demand generation to entire customer experience." "We need to ensure our team's voice is heard much more loudly internally by our key stakeholder."